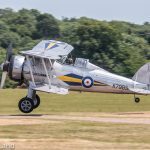 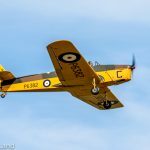 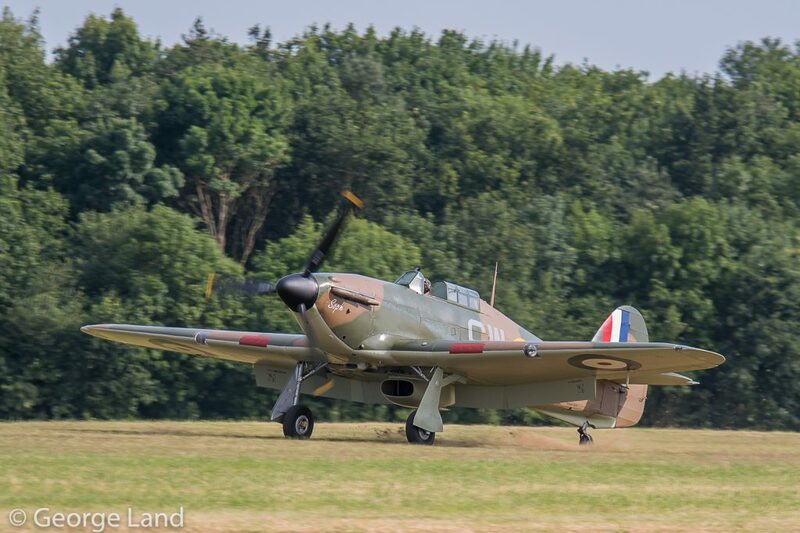 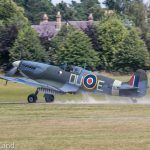 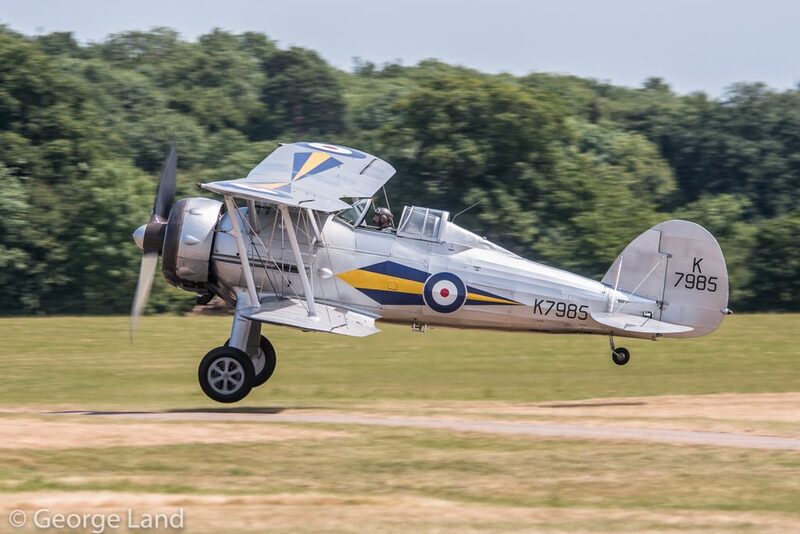 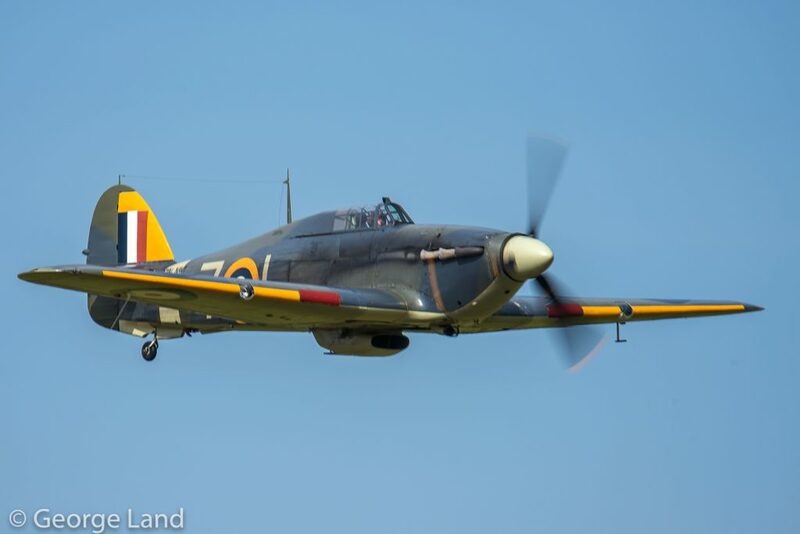 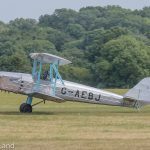 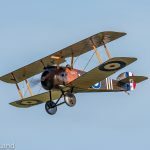 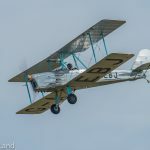 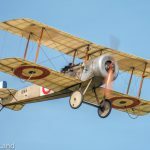 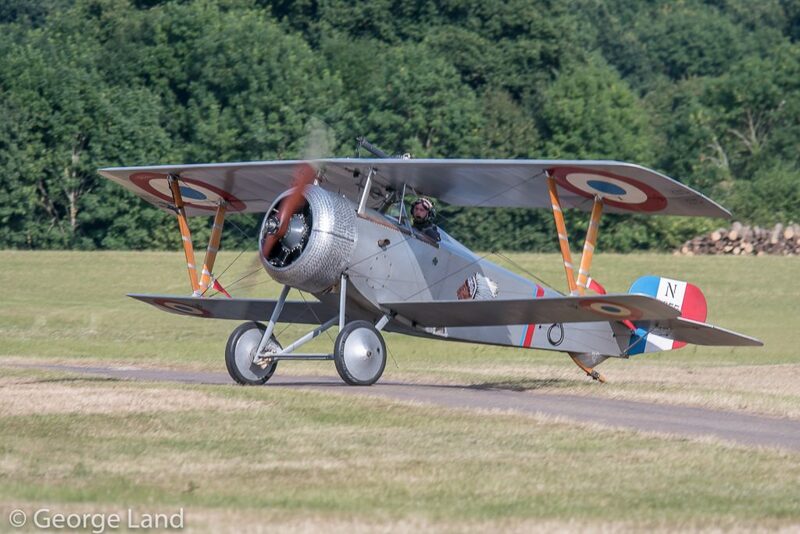 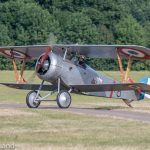 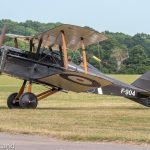 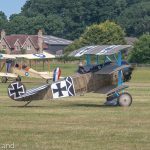 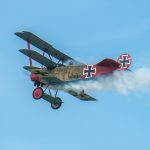 With 2018 marking the Centenary for the end of World War One, the Shuttleworth Collection in Old Warden, England paid homage to the service and sacrifice of the Armed Services in keeping the nation safe over the past century with a special air show on July 1st. 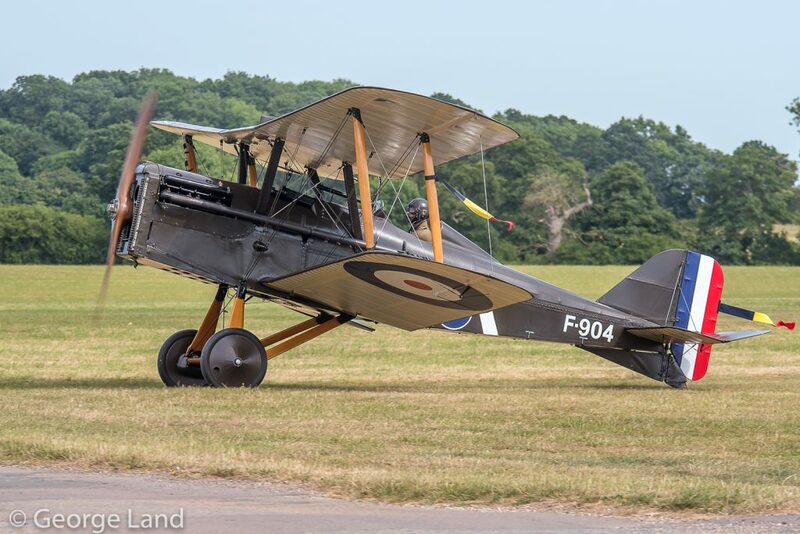 Although world renowned for their fleet of rare, historic aeroplanes, the Shuttleworth Collection does not focus exclusively on aviation; it also includes military vehicles and other forms of early transport, as witnessed by the static displays and in the parade before the air show began. 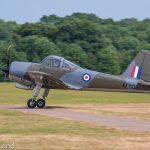 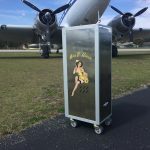 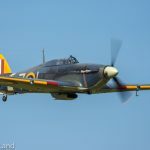 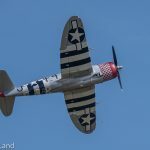 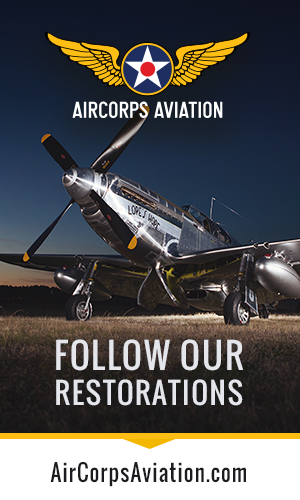 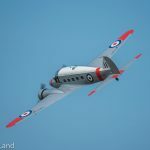 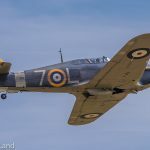 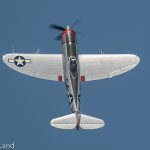 As for the air show itself, it opened up with the Shuttleworth debut for Fighter Aviation Engineering’s recently refinished Republic P-47D Thunderbolt 45-49192. 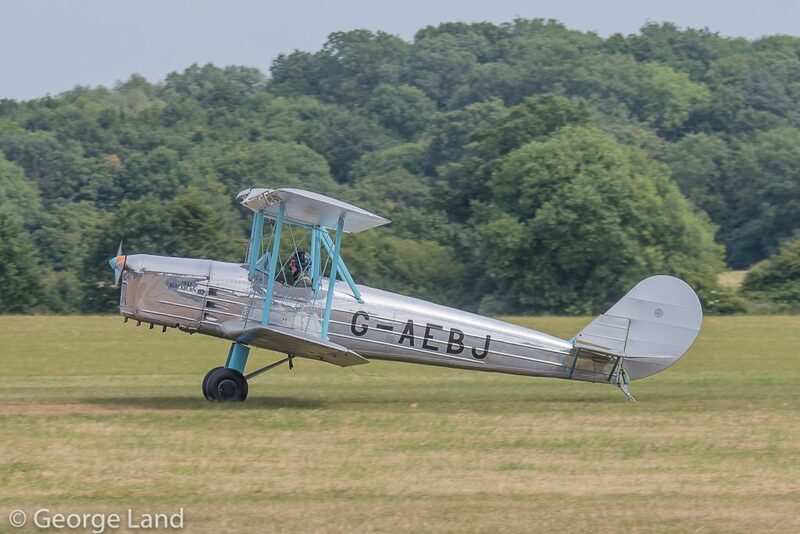 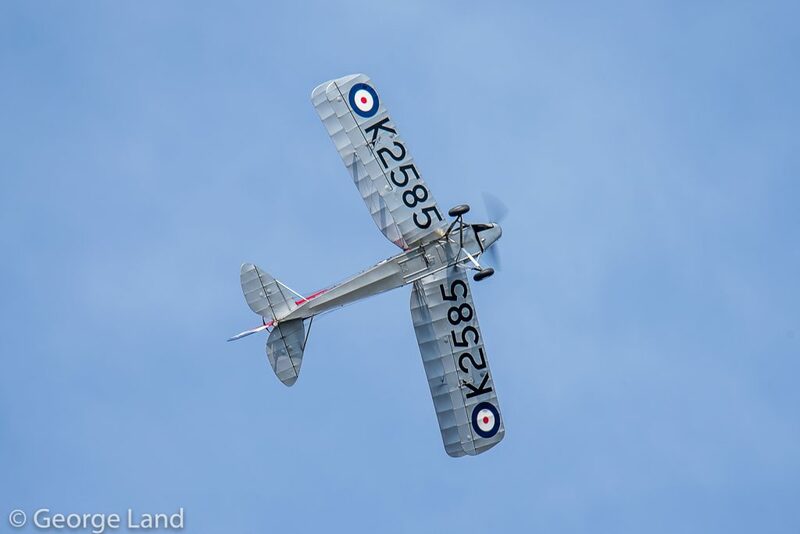 Operated by Air Leasing at Sywell, Pete Kynsey flew this beautiful aircraft at the show. 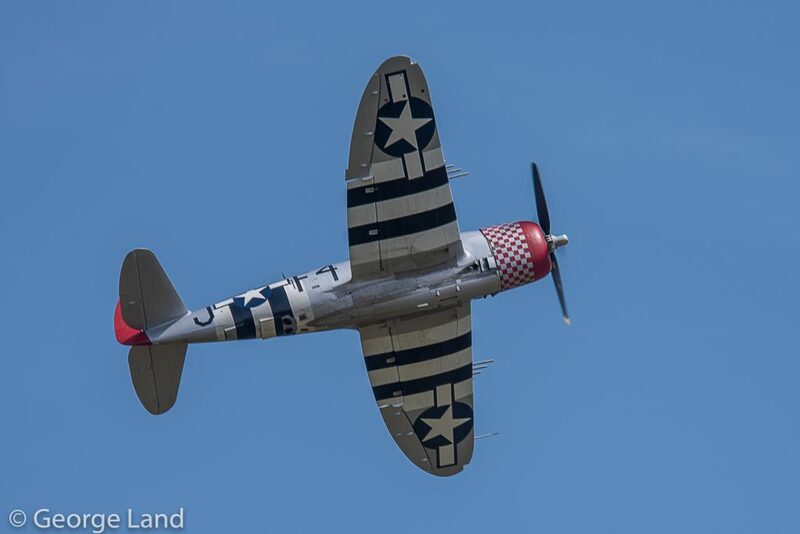 This P-47 flew for several decades with various owners, both in England and the USA, as No Guts, No Glory, but is now marked as Nellie, a 492nd Fighter Squadron aircraft initially based at Ibsley during WWII and attached to the 9th Tactical Air Force, USAAF before moving into Northern Europe following the D-Day landings. 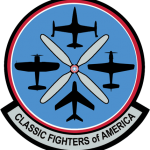 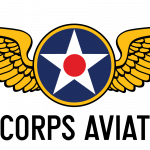 Interestingly, the 492nd Fighter Squadron is still operational today, flying F-15E Strike Eagles from RAF Lakenheath as part of USAF Europe. 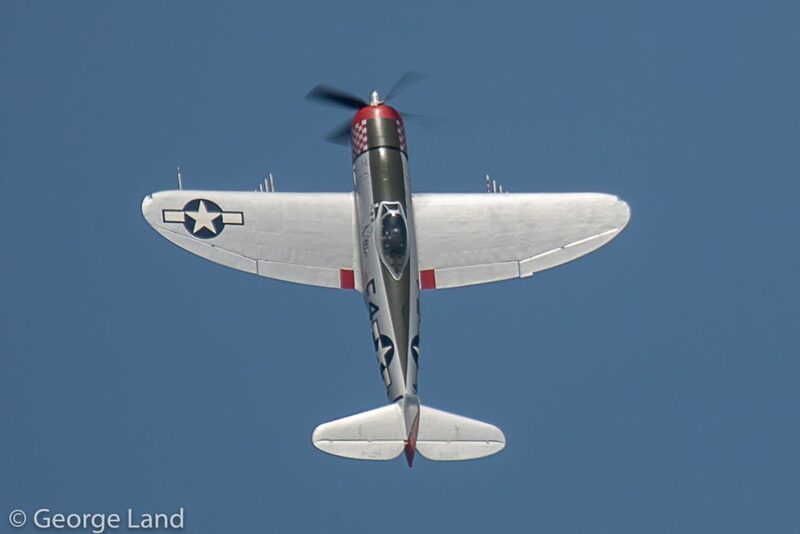 Kynsey’s emotive Thunderbolt routine clearly demonstrated the power and grace of this great American warbird, which weighs in at close to 7 tonnes! 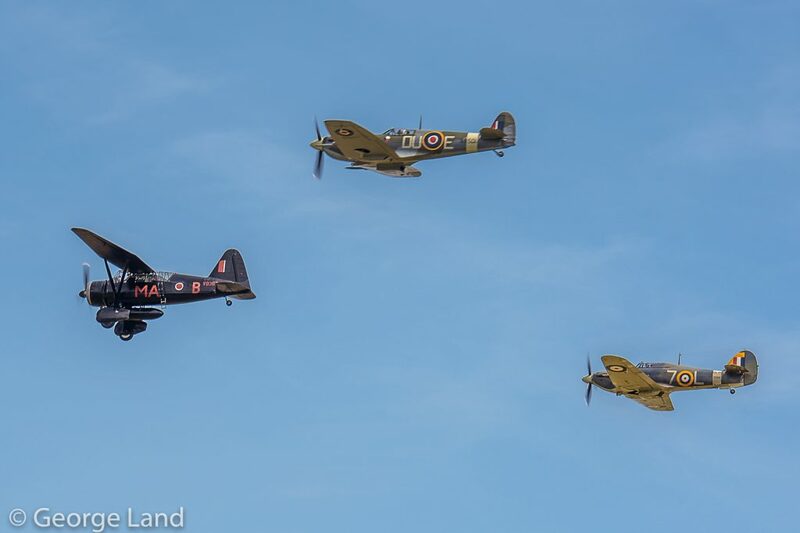 Five iconic British aircraft followed closely after Nellie’s display. 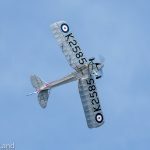 These included Hawker Demon Mk.I K8203 (built by Bolton-Paul in 1937) flying in the colours of RAF 64 Squadron and Gloster Gladiator Mk.I L8032 (dressed as K7985 of A Flight, RAF 73 Squadron. 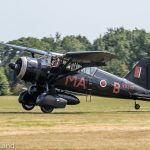 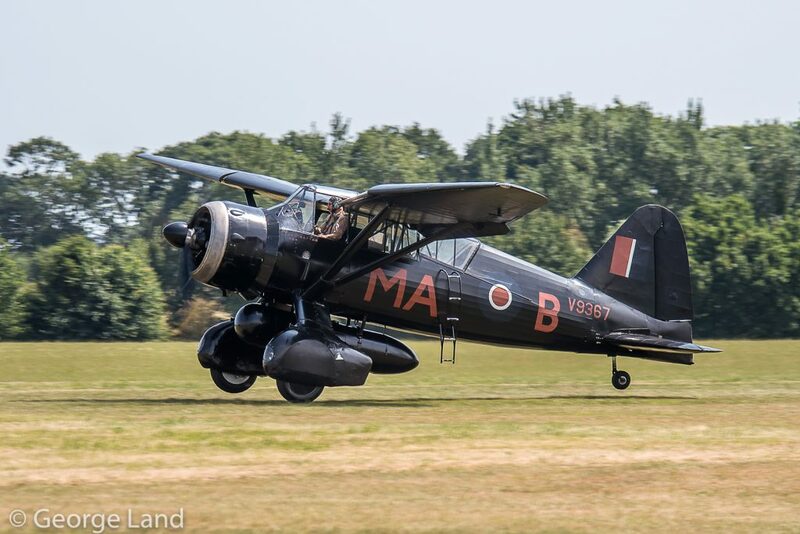 Then came the collection’s Westland Lysander Mk.llla V9552 painted to represent MA-B/V9367 of 161 Squadron which helped support Special Operations Executive clandestine operations in enemy territory during 1942. 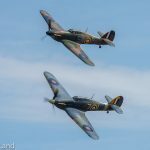 The Lizzie had as her escorts Hawker Sea Hurricane IB Z7015 off one wing and Supermarine Spitfire LF.Mk.Vc AR501 off the other. 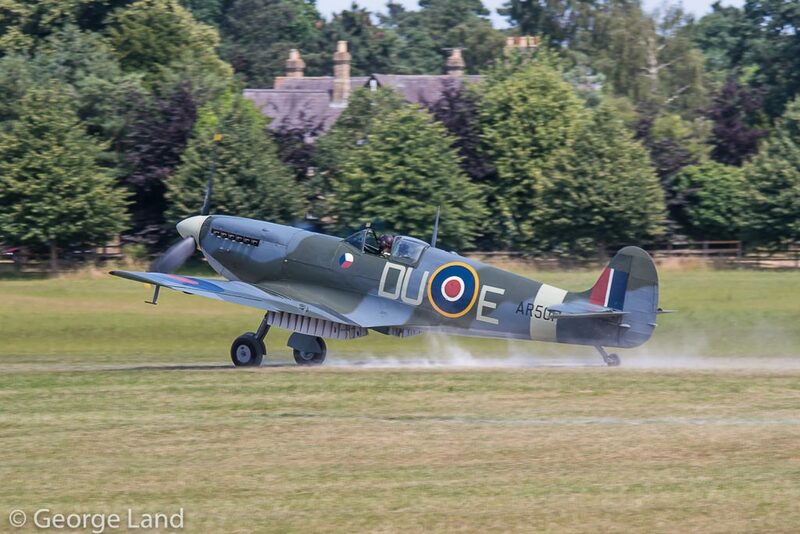 Oddly enough, the Spitfire was license built by Westland at Yeovil. 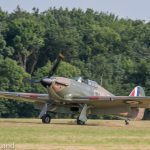 She served in combat with RAF 310 (Czech) Squadron at Exeter during July 1942 and has only recently re-emerged in 312 (Czech) Squadron markings following a long rebuild at Old Warden. 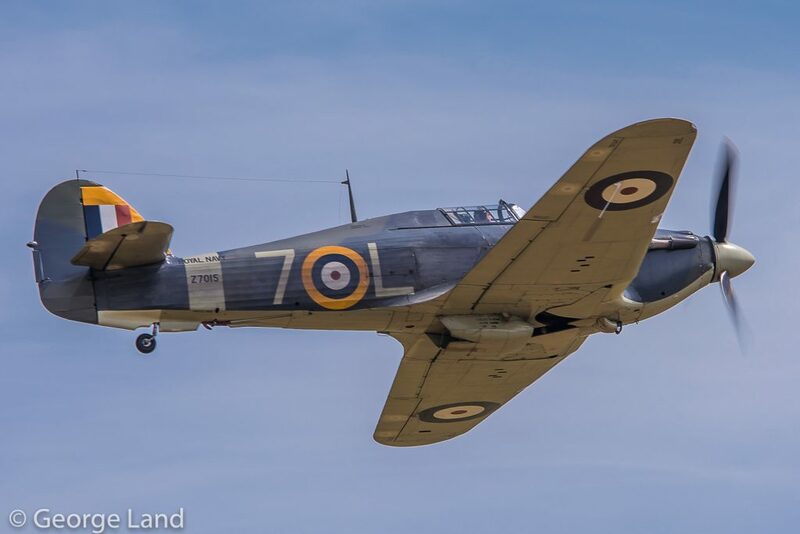 Sea Hurricane Z7015 is actually a Canadian Car & Foundary-built example, and served with Naval Air Squadron 880 as well as 759 Squadron (while at the Naval Fighter School). 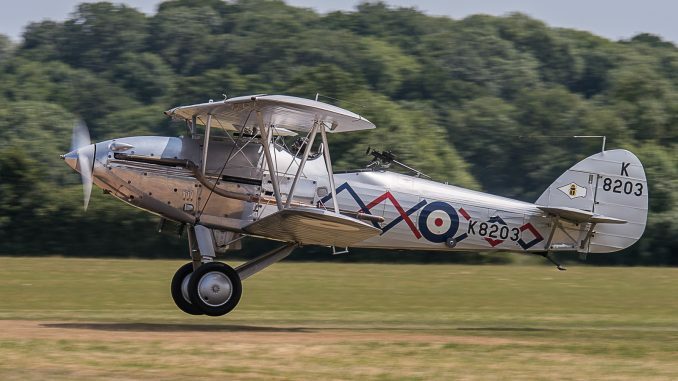 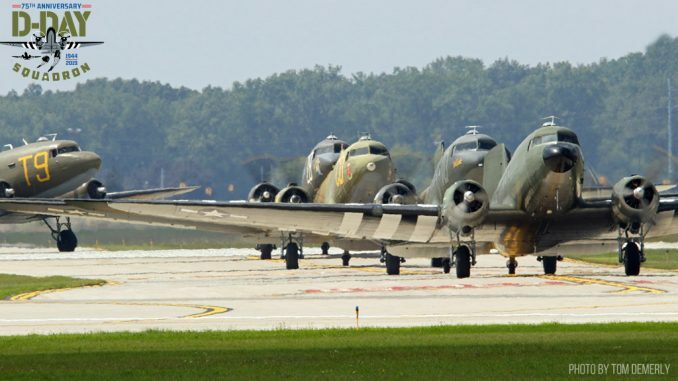 Such was the amazing pace of aeronautical advancement during the 1930s and 1940s, that just four years separate the state-of-the-art as it was in 1937, when Demon K8203 and Gloster Gladiator L8032 first flew, from where it sat in May 1941, when the Thunderbolt’s prototype initially took to the skies. 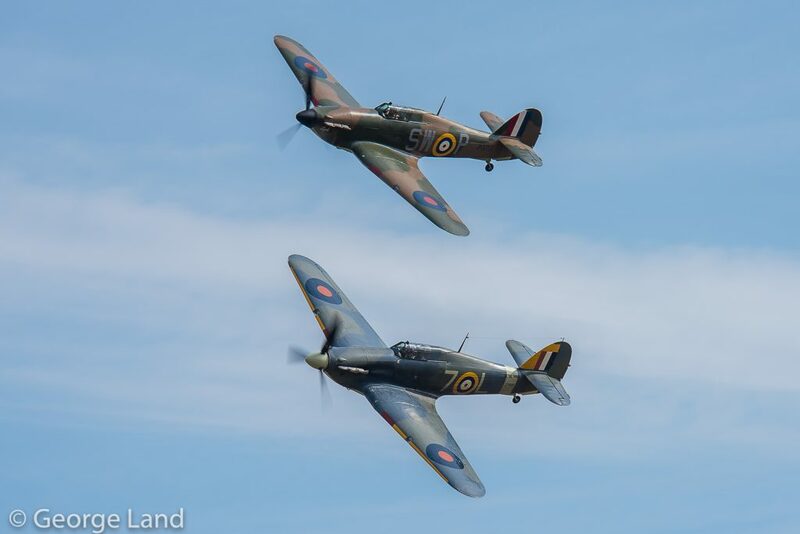 Spitfire AR501 and Sea Hurricane Z7015 both flew for the first time in 1941 as well. 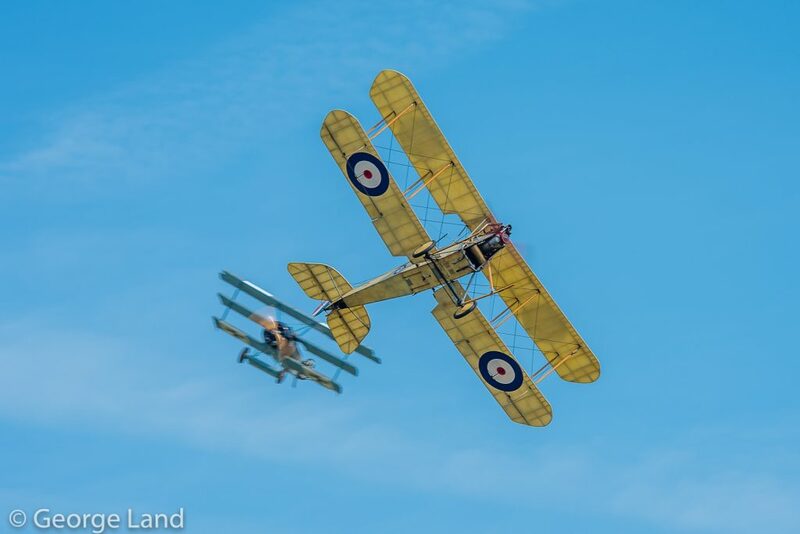 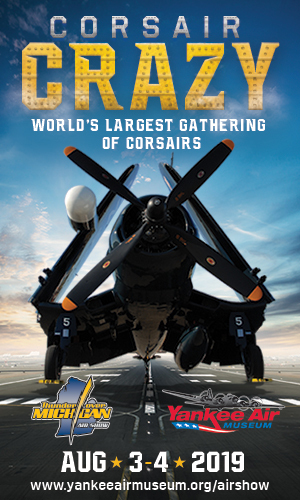 The Gladiator and Demon represented the ultimate generation of biplane combat aircraft, while the Lysander, Hurricane and Spitfire displayed the style of RAF technology that served Britain in the early days of WWII from the Norwegian Campaign, through the Battles of France and Britain, then into the Mediterranean campaign. 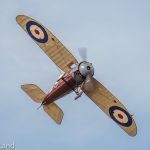 The next series of displays featured a variety of World War One-era designs, including trainers and fighters and even a civilian version of the Sopwith Pup biplane scout. 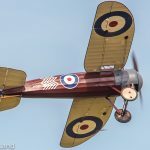 These aircraft included a replica Sopwith Dove G-EAGA, built in 1990, as well as a more recently manufactured Royal Aircraft Factory BE2e replica, wearing the paint of A2943 at the time that aircraft served with RAF 7 Squadrons the personal mount of Capt. 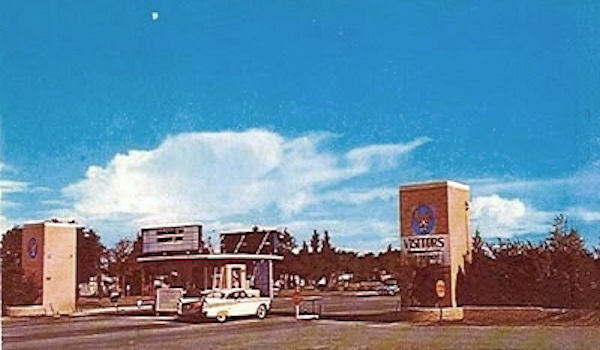 Webb Brownealong. 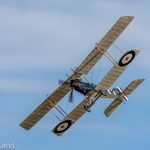 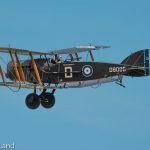 There was also an original Avro 504K, E3273 dating from 1918, a faithful replica of a Sopwith Triplane painted to represent N6290 Dixie II of No.8 Naval Air Squadron, and replica Sopwith Camel F.1 G-BZSC flying as D1851 IKANOPIT of 70 Squadron, Royal Flying Corps. 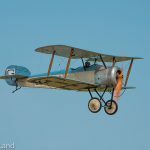 And finally the Shuttleworth Collection’s marvelous, original Bristol Fighter F.2B D8096 was in the air telling the history of the Royal Flying Corp.
Next came a very entertaining demonstration by part of the Great Warbirds Display team that fly scale replicas of World War One aircraft. 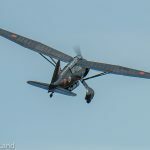 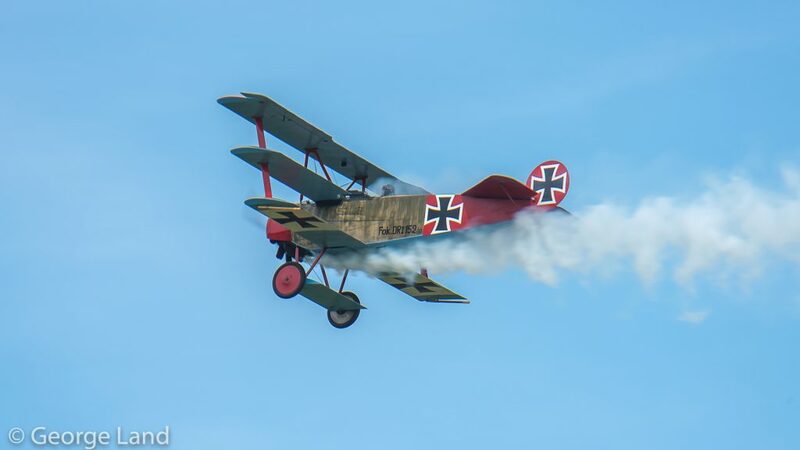 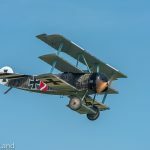 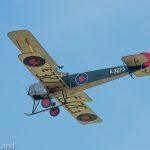 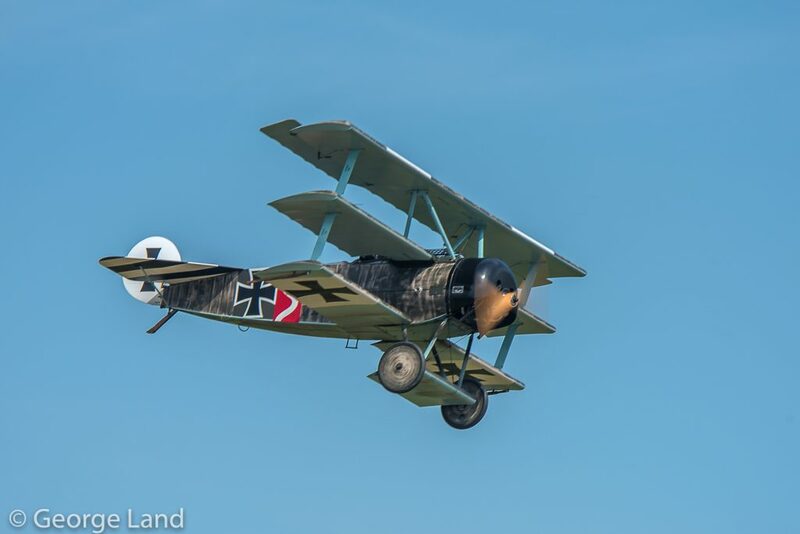 The German Army Air Service was represented by two colourful JG-1/Jasta 6 Fokker Dr.1 Triplane replicas: 403/17 of Lt. Johann Janzen and 556/17 of Lt. Ludwig “Lutz” Beckmann. 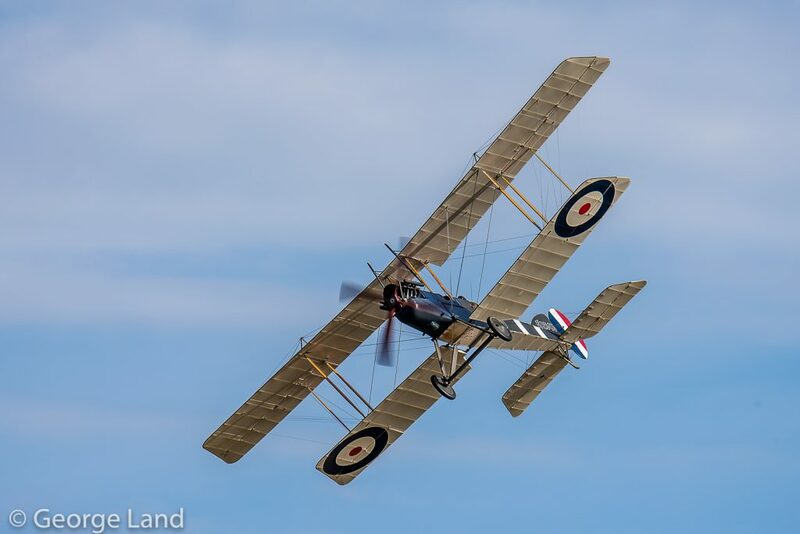 The opposition in the aerial dogfighting came in the form of a Sopwith Triplane that represents N500, the first Triplane prototype flown by A Flight, No. 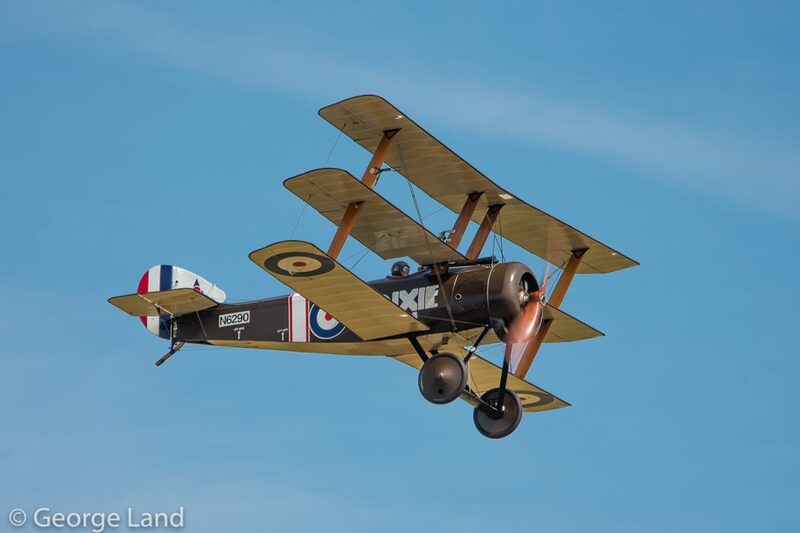 1 Squadron of the Royal Naval Air Service alongside Royal Aircraft Factory SE5a B595 of No. 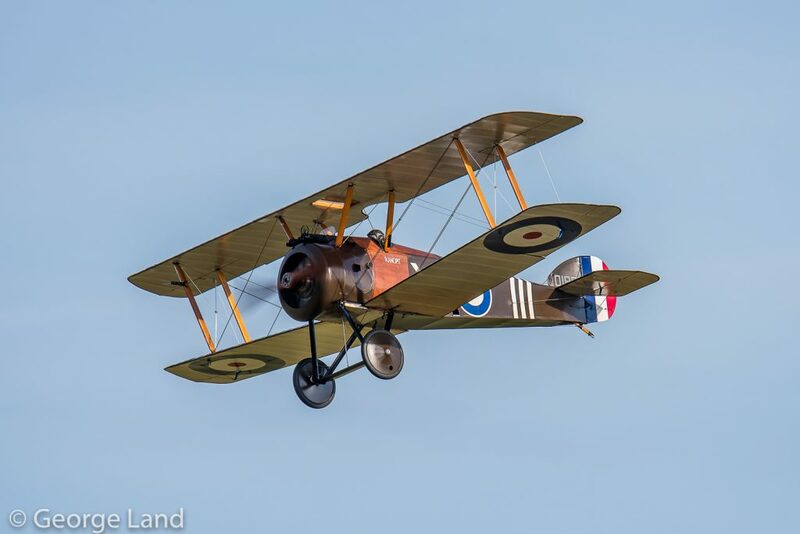 56 Squadron, flown during WWI by Lt. M. E. Mealing, MC. 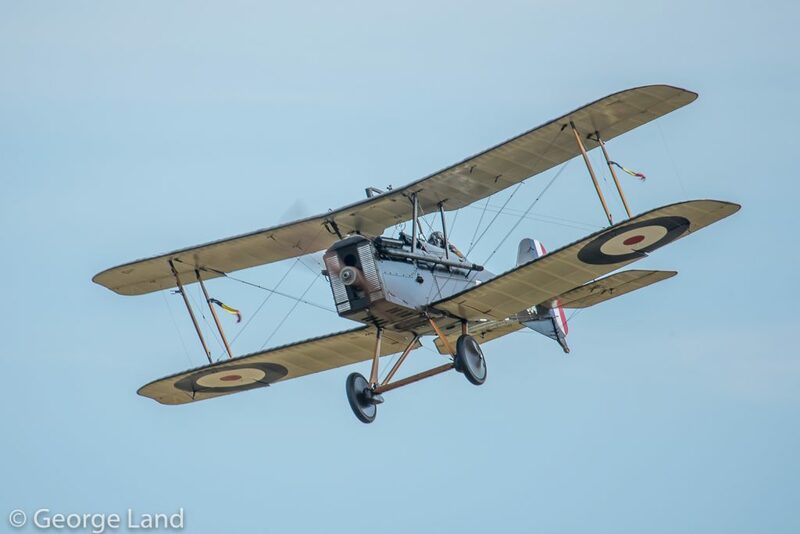 Last, but certainly not least, came a replica Royal Aircraft Factory BE2c, a fragile, early-war biplane which the Royal Flying Corps initially fielded in the artillery observation role, but later relegated to training roles due to its vulnerability to German fighters. 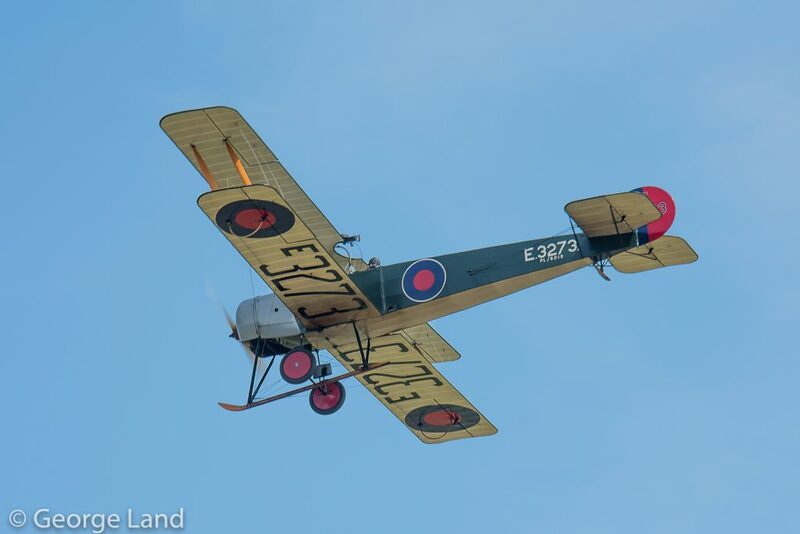 This particular aircraft is known locally as the “Biggles Biplane,” because it was built for the film “Biggles Sweeps the Skies” about W.E. 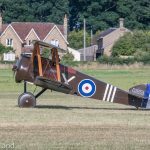 Johns fictional WWI hero James Bigglesworth, aka Biggles. 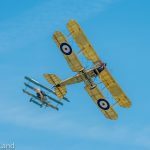 The team flies with a great deal of skill, clearly showing how chaotic the skies could be above the trenches in World War One, with planes engaged in combat crossing over each other and filling the air space with maneuvers coming from all directions. 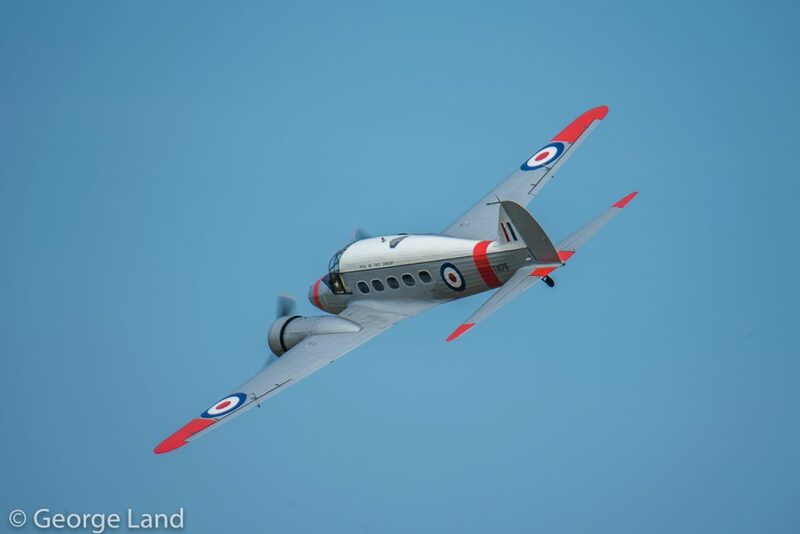 Next to display was another Shuttleworth favourite, the Avro C.XlX Anson, flying as TX176 from the RAF Coningsby Station Flight. 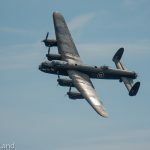 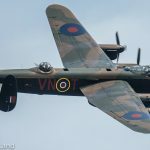 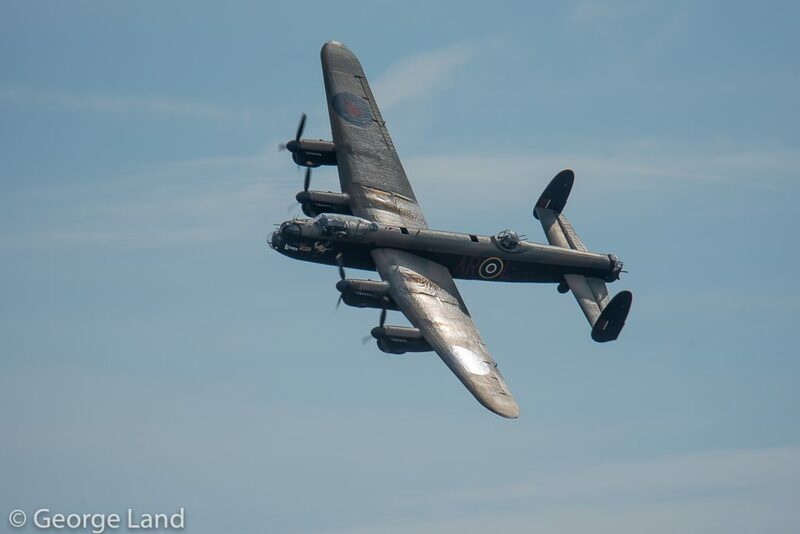 This linked nicely into the next segment which featured a present-day resident of RAF Coningsby, the Battle of Britain Memorial Flight’s Avro Lancaster B Mk.1, PA474, which performed three glorious passes. 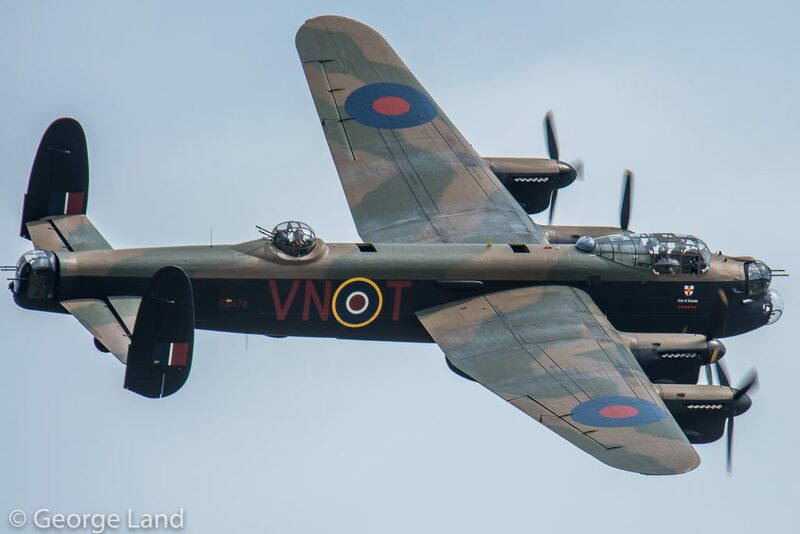 Each flyby presented clear topside views showing off the upper Dark Earth/Dark Green camouflage perfectly above the underside painted in Night Black. 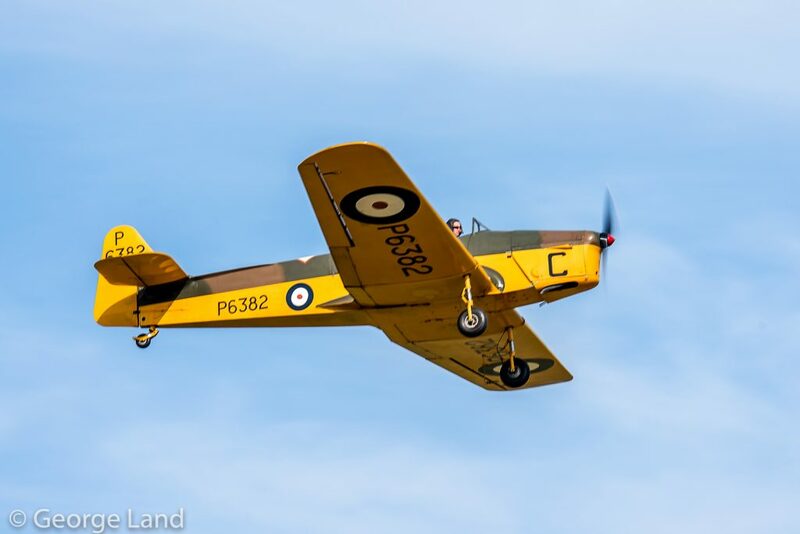 The tempo then changed again as it became time for a pair of trainers to take to the sky: the beautiful and unique Blackburn B.2 biplane G-AEBJ dating from 1936, and Percival Provost T.1 XF603 of 1950s vintage. 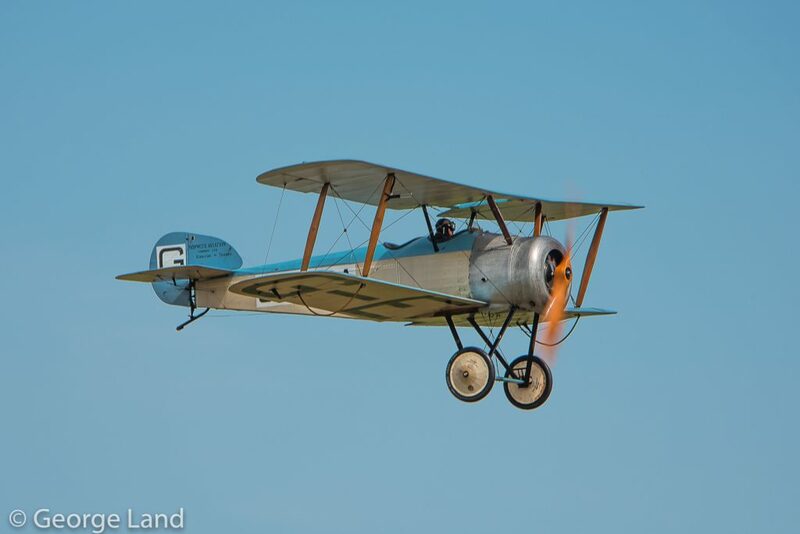 The Blackburn B.2 is an unusual design for a trainer of that period, with its side-by-side seating arrangement, and needless to say, it wasn’t manufactured in large numbers, despite its elegant appearance. 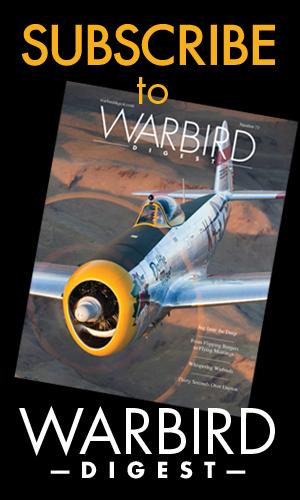 The Provost on the other hand, had a successful career, and enjoyed some exports to foreign air arms as well. 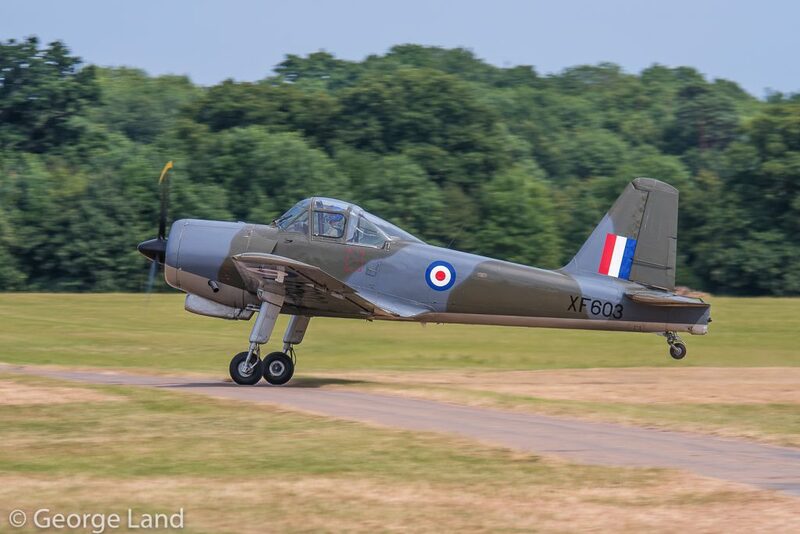 Most RAF examples of the Provost appeared in training livery, but this particular example is wearing an unusual camouflage scheme representing an aircraft bound for service in Oman. 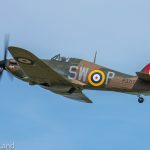 Due to the niceties of the period, the aircraft had to wear an RAF serial and roundels for the delivery flight from the UK to the Middle East. 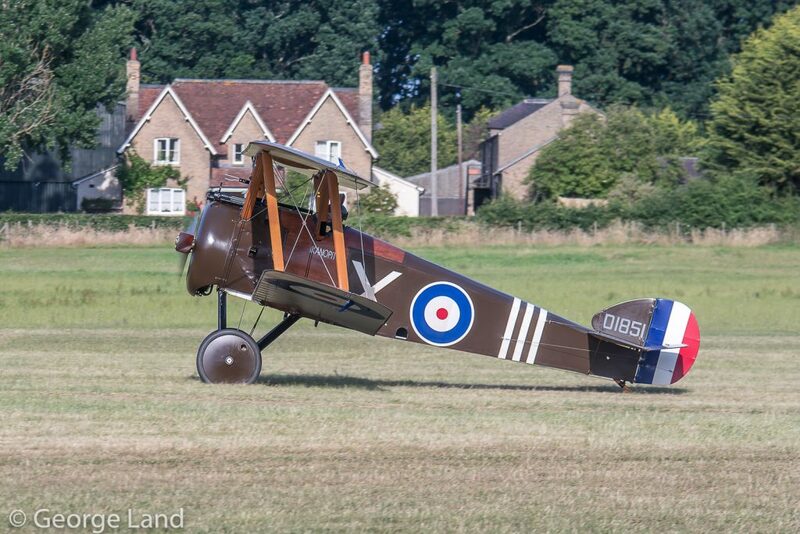 This was an interesting choice of livery for the owner. 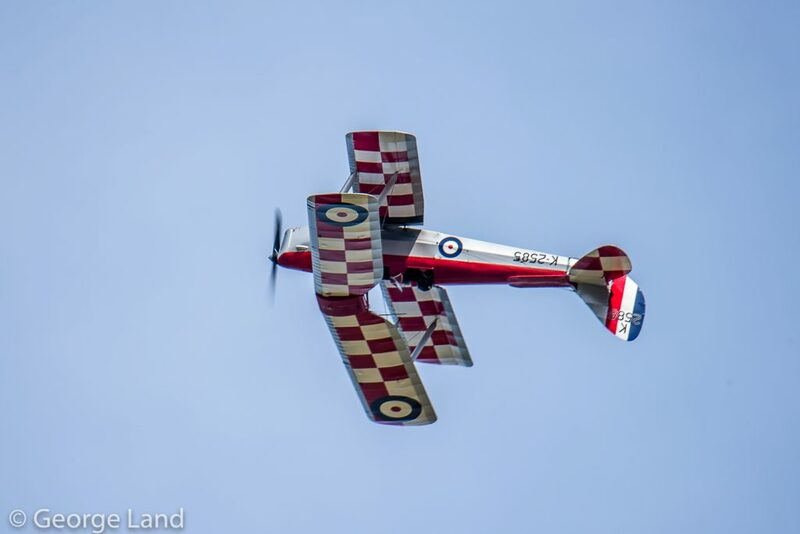 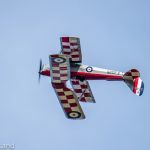 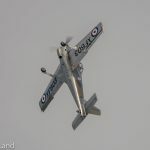 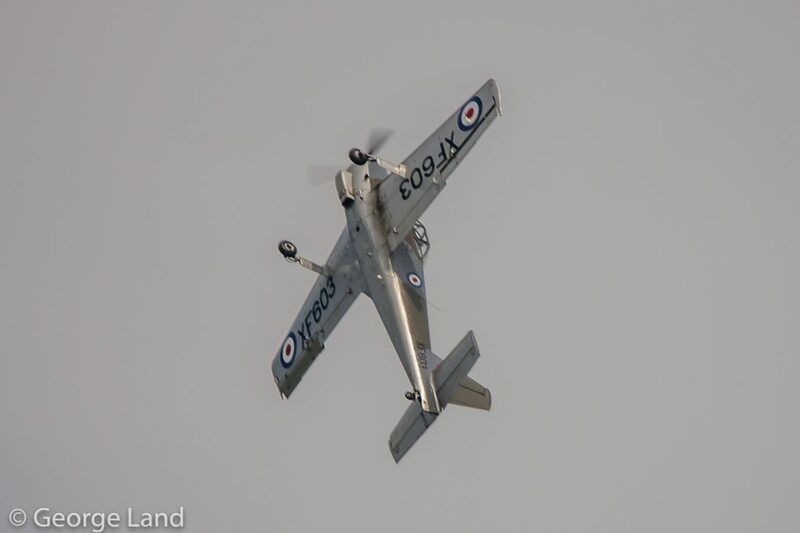 The Provost put on a spirited aerobatic display that started high and, following a series of loops and turns, finished at low level, showing off the trainer’s aerial prowess to the full. 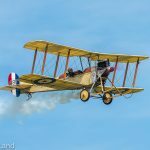 The pace now switched back to World War One, with the launch of the Shuttleworth-based Royal Aircraft Factory SE5a, coded F904, of No. 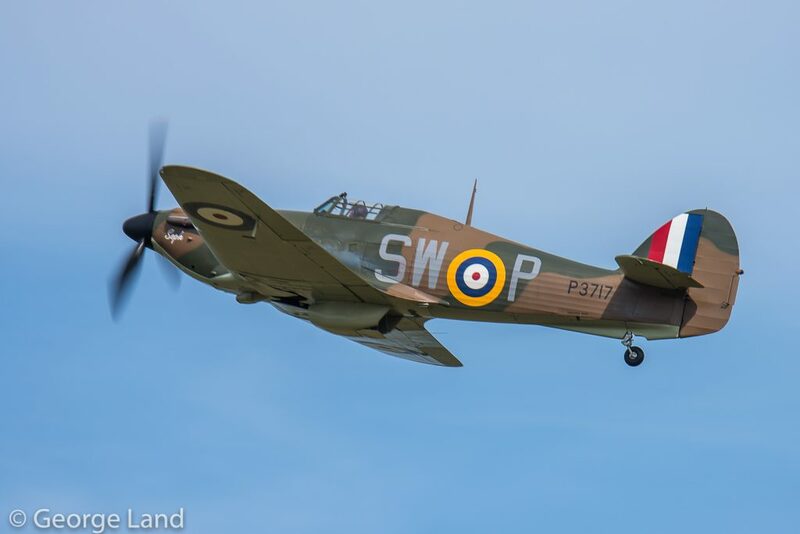 84 Squadron, RAF. 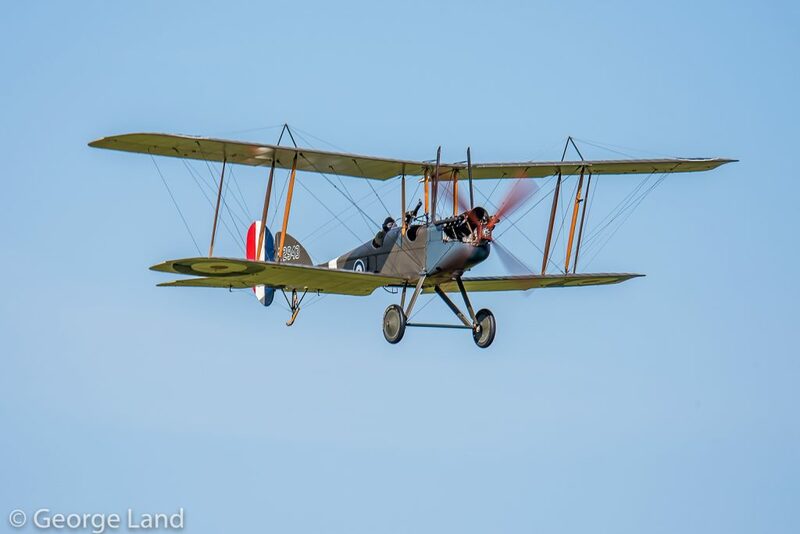 This SE5a is an original airframe, built under license by Wolseley Motors in 1918. 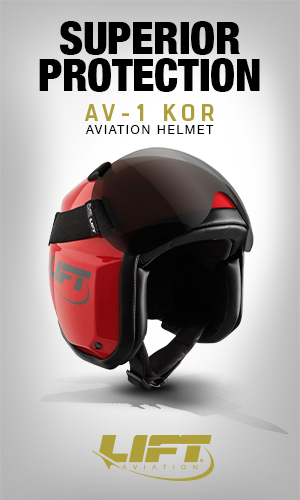 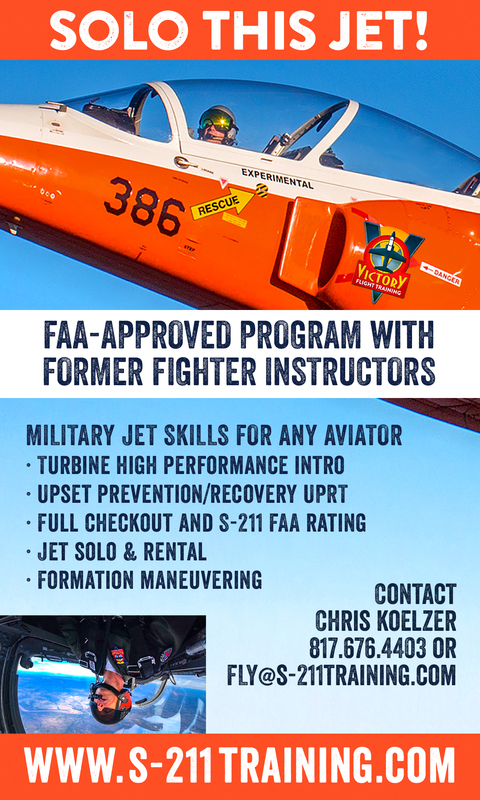 F904 is also a combat veteran. 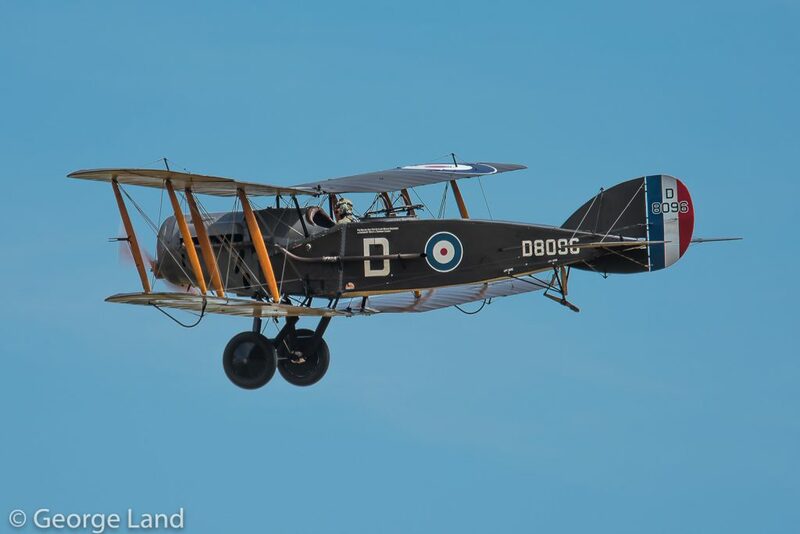 84 Squadron’s commander, Major C.E.M. 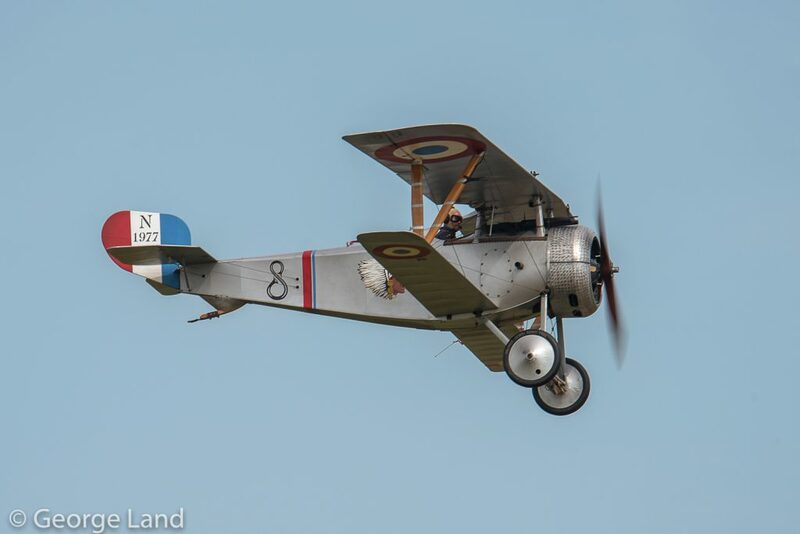 Pickthorn MC, was flying F904 when he dispatched a Fokker D.Vll in early November 1918. 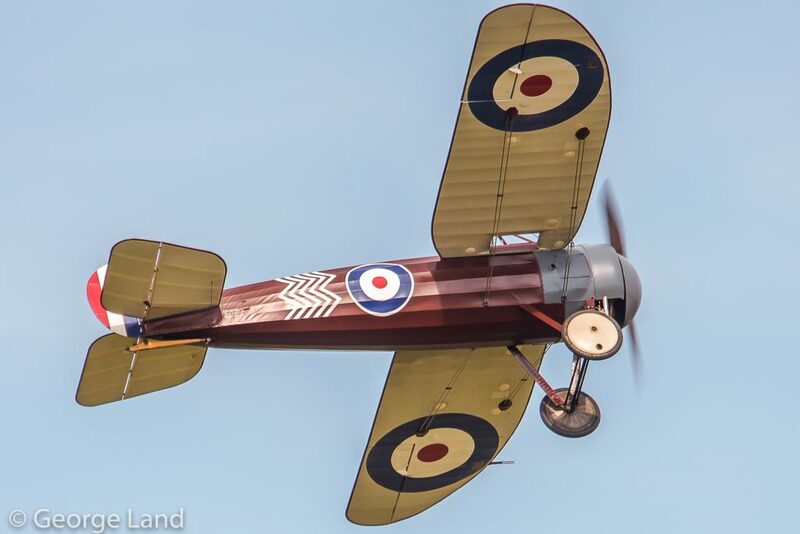 This fabulous aircraft was joined in the air by Shuttleworth’s replica 1917 Bristol M1C monoplane fighter, painted to represent C4918. 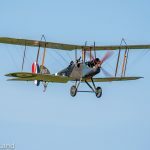 Three visitors joined the Shuttleworth duo in the skies. 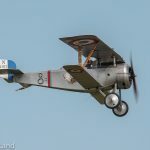 These included a replica Bristol Scout Model C (painted to represent 1264 as flown by Flt Sub Lt. F.D.H. 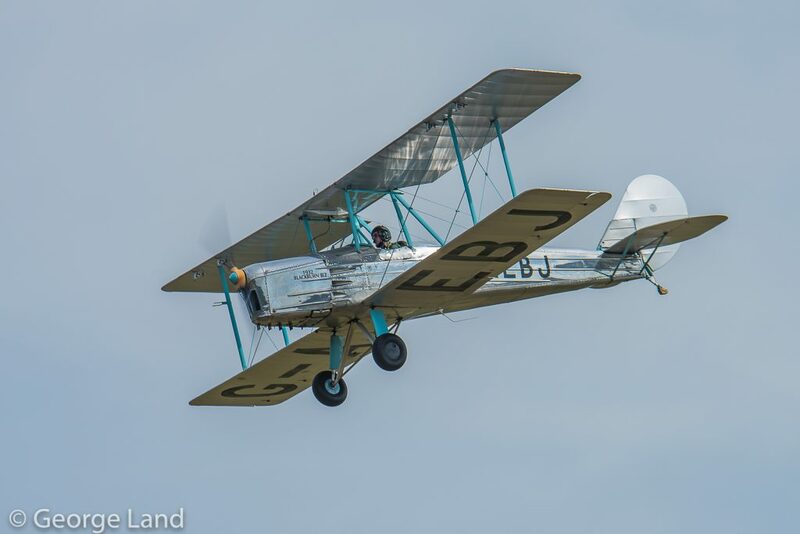 ‘Bunnie’ Bremner of No. 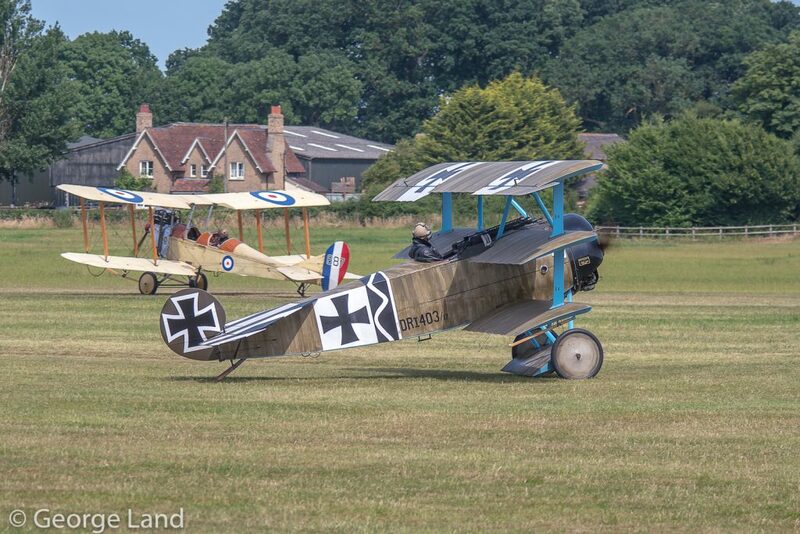 2 Wing Royal Naval Air Service in the Eastern Mediterranean), a replica Fokker Dr.I Triplane Dr1 from Breighton (representing 152/17 flown by the infamous ‘Red Baron’, Manfred von Richthofen, of JG-1/Jast 11, German Army Air Service), and a replica Nieuport 17 Scout from Stowe Maries (representing N1977 flown by the American volunteer, Sgt. 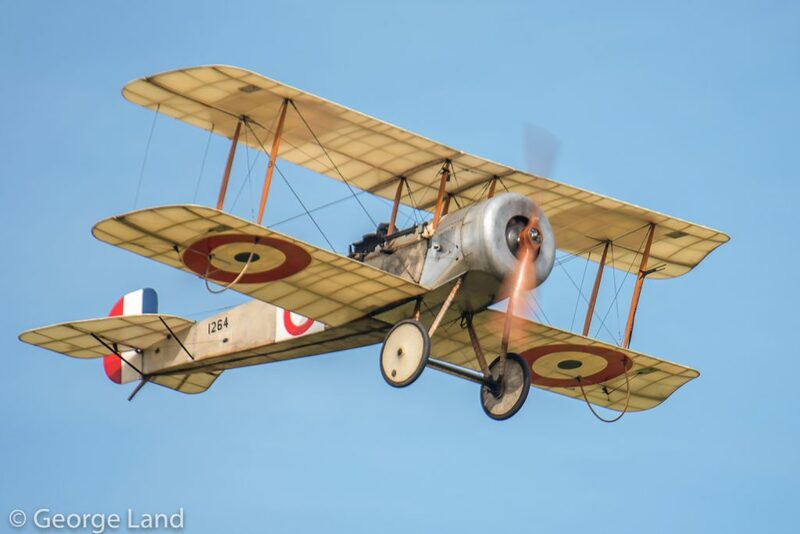 Robert Scoubiran in the Escadrille Lafayette of the French Aeronautique Militaire). 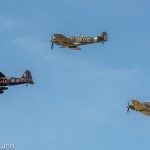 The display then switched back to the WWII-era, with the appearance of the Hawker pair consisting of Shuttleworth’s Sea Hurricane Mk.IB and the Battle of Britain combat-veteran Hurricane Mk.I P3717, coded as SW-P of 253 Squadron. 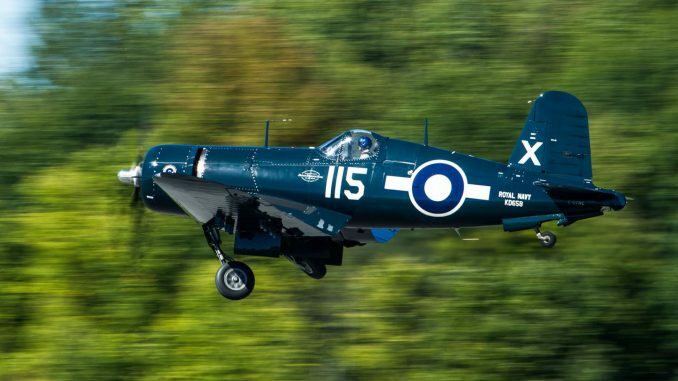 This Brooklands-built aircraft, in the hands of Polish Pilot Officer W.M.C Samolinskiis, is credited with shooting down a Messerschmitt Bf 110, before itself receiving damage from another Bf 110, which grounded the 253 Squadron fighter for the remainder of the Battle of Britain. 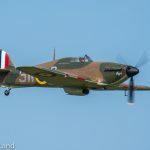 The Hurricanes flew a short series of close formation passes before switching to excellent individual displays, which demonstrated why the Hurricane was such a good dog fighter and stable gun platform during its day. 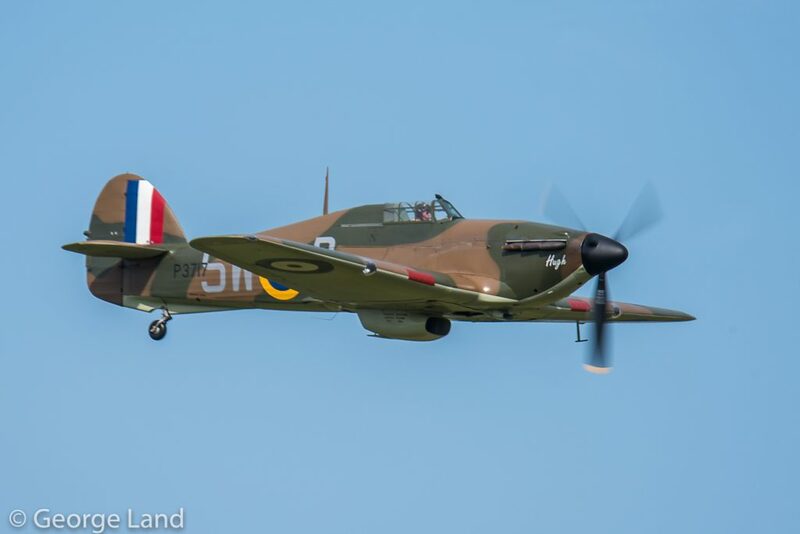 Flight training again became the theme following the Hurricane performances. 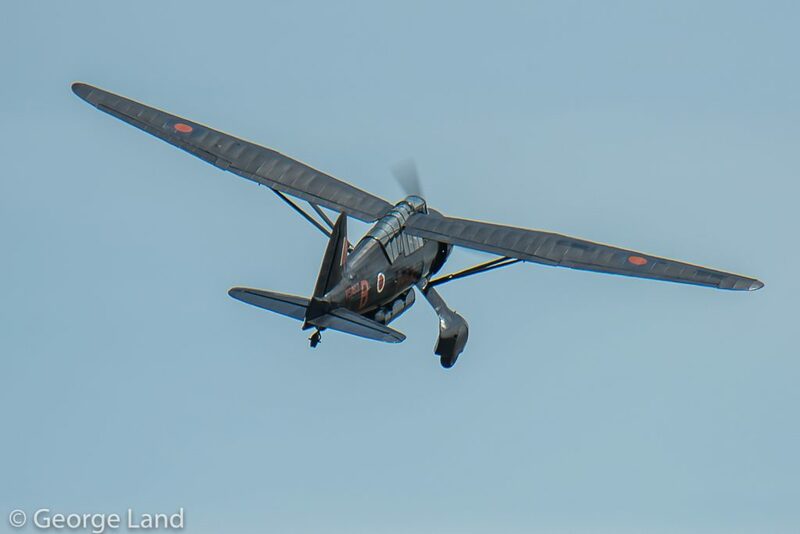 First up was the Slingsby T.13 Petrel Glider, followed by de Havilland DH82A Tiger Moth K2585, with Miles M14a Magister P6382/C bringing up the rear. 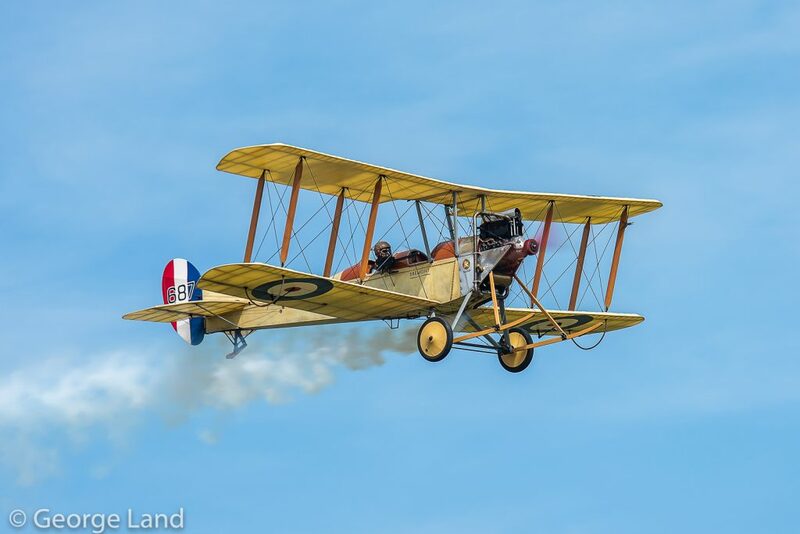 Unfortunately, the wind conditions were such that the planned flights for ‘the Edwardians’ could not take place at the Military Pageant, because these delicate pre-1910 designs were too vulnerable to strong gusts. 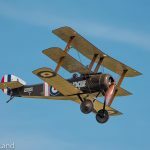 However, in their stead, the Royal Aircraft Factory BE2e and replica Bristol Scout Model C, along with the Sopwith Triplane, Sopwith Dove and Sopwith Camel, all flew single ship displays to fill in the display time before the show’s final act took place. 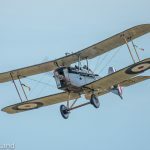 This was an especially moving moment beginning in the form of a minute’s silence followed by the sounding of the last post in solemn memory of all those who had fallen in conflict. 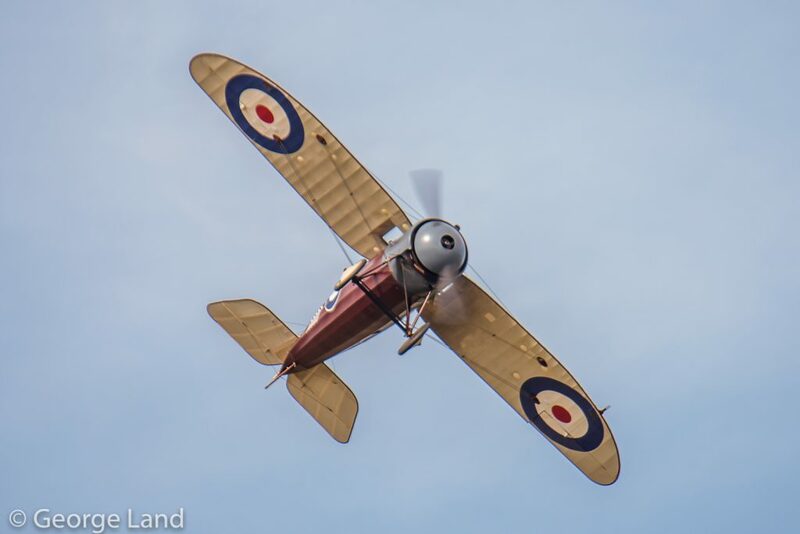 At the conclusion, the Shuttleworth Collection’s Bristol F2.B Fighter dropped poppies in remembrance of the fallen. 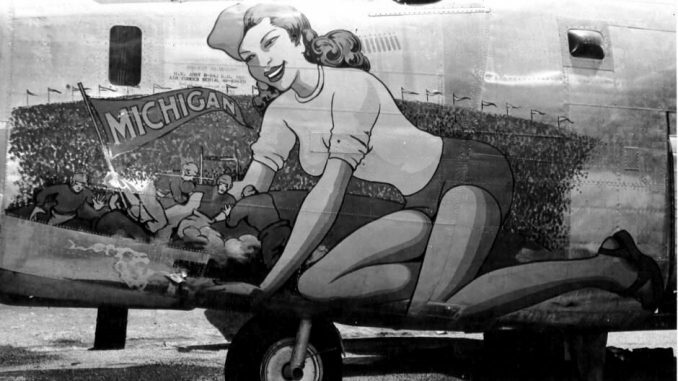 It was enough to tug the strings of even the hardest of hearts. 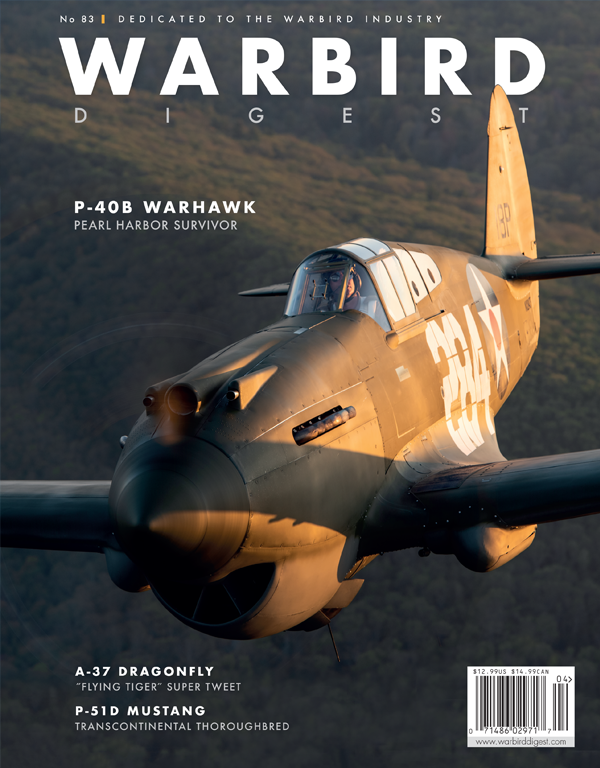 WarbirdsNews wishes to express our deep thanks to George Land for this report, and for his patience in the delay with getting it published. 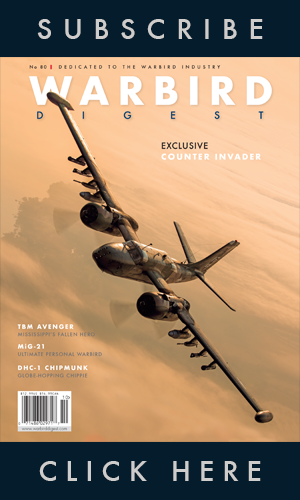 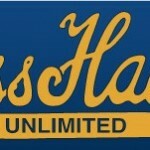 We hope our readers have enjoyed his contributions as much as we have!